The preface describes how the middle-aged Rowson became smitten by Marx and Engels’ exciting prose when he was only 16. 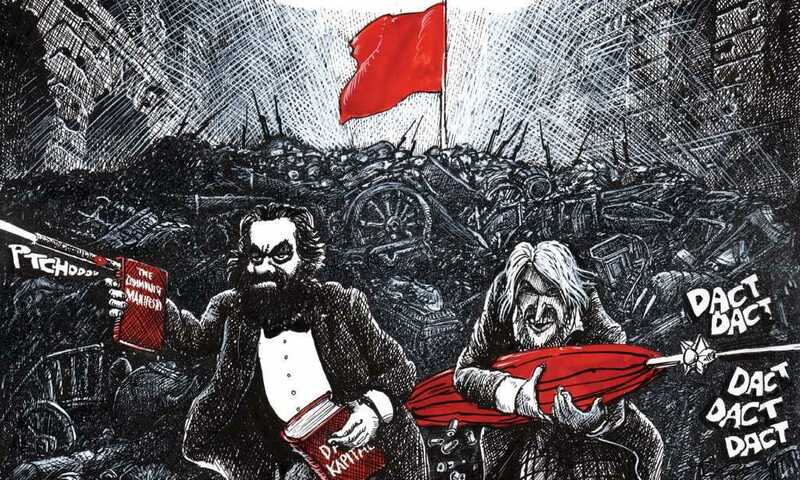 Aside from expressing his great admiration for Marx’s writing, as well as his own critical stance, he furnishes the reader with some historical backdrop to the completion of The Manifesto. Marx had been commissioned to write it by a socialist group in the summer of 1847, but, under pressure, succeeded in producing it at the beginning of 1848. Significantly, that was before the outbreak of revolutionary movements in Europe later on in 1848. Rowson goes on to explain that the initial publication failed to attract the attention of many people. Only after the events of the Paris Commune in 1871 did the pamphlet receive a wide audience and a publication renewal. It’s what he does best. He’s a cartoonist, not an analyst. If you take it too seriously, you’ve already missed the point. The Communist Manifesto was mainly Engels’ work, if I’m not mistaken. It is a brilliant piece of literary work, filled with deathless phrases and a pleasure to read. It describes the raw vigor of capitalism attractively and accurately. It can be read as a poetic meditation — if you can forget the murderous mayhem that it unleashed in later years. There is no reason to turn this swell piece of prose into a comic book. Marx’s The Eighteenth Brumaire of Louis Napoleon can also be read for interest, if not pleasure. However, anyone who thinks the Marx was a great writer, should read Das Capital. It is of the school of higher gobbledygook. And it is long. This cartoonist should spend the next several years reading Das Capital turning into a comic book. That will be his punishment for doing this silly work. I finally got around to reading The Communist Manifesto 14 years ago. It’s odd. Quite odd. And then was born Social Supremacism, where absolute power over others is the Final Solution. No self constraints. No power checks. That primitivism of absolute power is the reason that most murdered Communists were by other Communists. And the reason that Marxism is nothing more than a reactionary movement against Modernity (power restraint). One awaits with disgust the likely future similatly sympathetic treatment of Mein Kampf and Chairman Mao’s Little Red Book. People who produce this sort of propaganda ought to be treated in precisely the manner that the multitudinous victims of these pernicious ideologies were, each and every time they have been emanentized by their believers. Deportation to Venezuela comes to mind, as a just solution. Let them actually dwell in the hellholes their ideologies create, and suffer the consequences accordingly. Kirk, They will never dwell in the hellhole of their ideologies as shown by the steak eating Maduro. Socialism fully implemented in the US would be no different for the little people while the young socialist leaders would wear $3500 suits and old socialist leaders would live in walled and gated estates.